With too many opened programs taskbar can become cluttered. We have already seen Taskbar Helper software to move program buttons from taskbar to the system tray. If you only want to do this for Firefox (and other Mozilla products like Thunderbird, Songbird), then checkout “MinimizeToTray revived” plugin extension. 1. 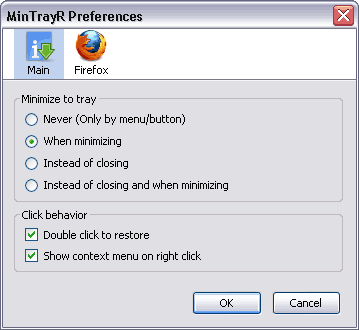 Launch Firefox & download MinimizeToTray revived extension. 2. Install this extension & restart Firefox browser. 3. To minmize to system tray Press F9 key or goto File > Minimize to Tray. 4. Double click Firefox icon on system tray to maximize it. You can customize options for this plugin, goto Tools > Addons and click Options button for MinimizeToTray revived listing. For sure one cool addon to reduce clutter on taskbar (ideal for regular Firefox users).